Leo realized the value in bringing Project of Heart to his school after he had seen IRS survivor Mary Lou Iahtail speak last year. 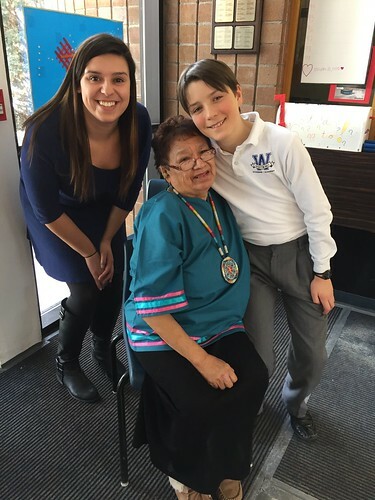 He wanted his classmates to have the chance to hear her story too, and for his school to take part in reconciliation event. On February the 8th, was able to have this come true, Westboro’s Academic Director Derek Rhodenizer saw the importance of having students learn about this much under-taught era in Canadian history, and welcomed Project of Heart to the Academy with open arms. The project was facilitated with grade 6, 7, and 8 classes taking part. As well as taking in the teachings and participating in the discussions, students created commemorative wooden tiles which will be mounted on the wall of Westboro academy to honour the victims and survivors of residential schools, and to serve as an education piece for future students at the academy. Finally, the students had the opportunity to meet Mary Lou Lahtail, a Cree elder, who shared her experiences of the IRS along with her knowledge and wisdom. Mary Lou smudged the tiles, and sang for the students in a heartfelt and emotional presentation that will live in the students’ memories for many years to come. Click the link below for audio of Marylou Iahtail at Westboro Academy. You’ll also hear an interview with Leo, the Westboro Academy student who waited over a year to have his dream of having Mary Lou come to his school realized. POH offers its congratulations to Westboro Academy — may this only be the beginning of your journey down the path of reconciliation!